Have you ever been to Paradise? Hawaii is often described as paradise and one of the most beautiful places on earth. Well, I have to agree! A recent trip there convinced me that there is Paradise on Earth. From sandy beaches lined with emerald-blue water and palm trees under serene skies to rugged black volcanoes that continue to reshape the earth, the Hawaiian Islands teem with diversity, beauty and poise. Even beyond this, the islands are flourished with a variety of plants, animals and ethnicities. While God’s beauty is everywhere, I must say there is an extra special “something” in Hawaii. It is breath taking! Our Luau Cruise, swap meets, Farmer’s Markets and espresso trips made for an extra special visit to Paradise. Below you will find brief descriptions of our espresso trips in Honolulu. ChadLou’s is a very comfy coffee and tea lounge. It is very rustic and has adequate seating, books and chess tables. Our barista Natalia was very professional and clearly enjoyed her craft. She even creates what I call “ cup art.” Natalia and other staff members draw on coffee cups, creating the most beautiful pictures and designs. These cups are on display throughout the store and make for very interesting conversation (see picture above). We had some delicious drinks including fresh cucumber water and pastries at Chadlou’s. My husband had a Kona Affagato (pictured above)! Yummy!!! I had the Honu Latte. This is a decadent drink infused with Caramel and Mac Nut. Delish!!! Our son had Iced Green Tea and our girls enjoyed M&M cookies and Hawaiian Mud Pie Ice cream. My husband also had a “roadie”: ice tea infused with island fruits and lightly sweetened. We all enjoyed this spot very much. I wished I had stopped back by again before returning to the Main Land! If you are ever in Honolulu, give them a visit. www.chadlous.com By the way….the price was right too. As some of my readers know, I do not blog about “Chain” Coffee Houses. I had no idea that Coffee Bean and Tea Leaf was a chain until we came back to the Main Land. So, in a sense I am going against my rule. However, after a bit of research I see now why they were appealing to me. 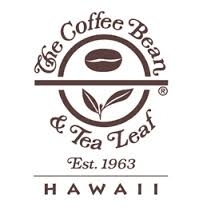 The Coffee Bean and Tea Leaf Company is the largest, privately held coffee and tea retailer in the United States. 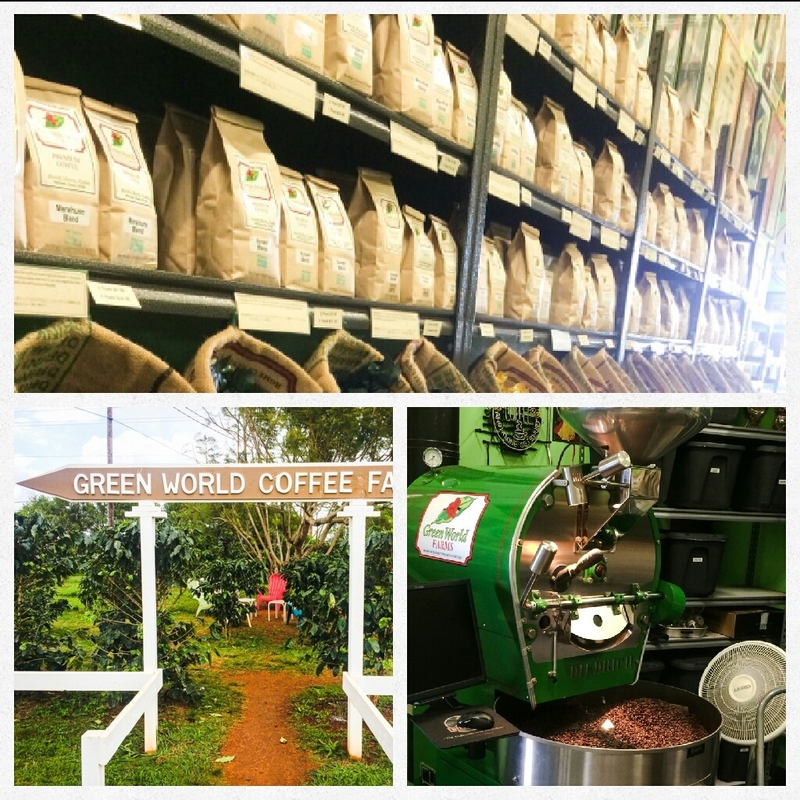 According to their website, they carefully hand craft their drinks and only select their beans and tea leaves from privately owned coffee bean farms and estates. They are so picky about bean selection that they only choose the top one percent of Arabica beans. From the moment I walked into the Blue Tree Café, I knew I was in for a treat! Blue Tree is definitely for the “green” living and health conscience person. The décor is modern with in-door and out-door seating. All of the furniture and equipment are from recycled material. Their menu is extensive: offering coffees, teas, smoothies, juices, raw oats, salads, pastries, etc. All food items (with the exceptions of pastries) are raw. They make their own nut milks and cold press all of their juices. They also use organic ingredients!! One of their mottos: “It’s Life Changing” is so fitting. I felt “changed” just walking in the door. This place just makes you want to put the “right” foods in your temple. I had and Iced Blue Tree Latte: Honey, house made almond milk, cinnamon and espresso. It was pretty good but not my favorite. My husband had the same beverage made hot. He did not like his at all. He also had the Almond Dream Smoothie. This drink went over a bit better than his latte did. Our kids had the following: Raw Oats bowl, Acai Bowl, House made Almond Milk, Very Verde Smoothie, Banana Bread Muffin, Zucchini Bread Muffin with cashew cream icing and a Blueberry Scone. All were very good. I know, because I tasted everyone’s food. LOL! 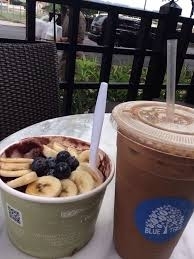 My absolute favorite was the Acai Bowl. Topped with fresh bananas and crunchy granola, it was incredibly delicious! This espresso trip was great but not because of the coffee drinks we had. They were pretty average in my opinion. Maybe on another trip we will try a different coffee drink. On the other hand, the food was really good and healthful. The Blue Tree Café is not easy on the wallet though. The total bill was a little over $50.00!!!!! Pretty pricey. Right? Well, do not let that deter you. Give them a try if you are ever in Honolulu. www.bluetreejuice.com Also, park in the parking structure. They will validate your parking. 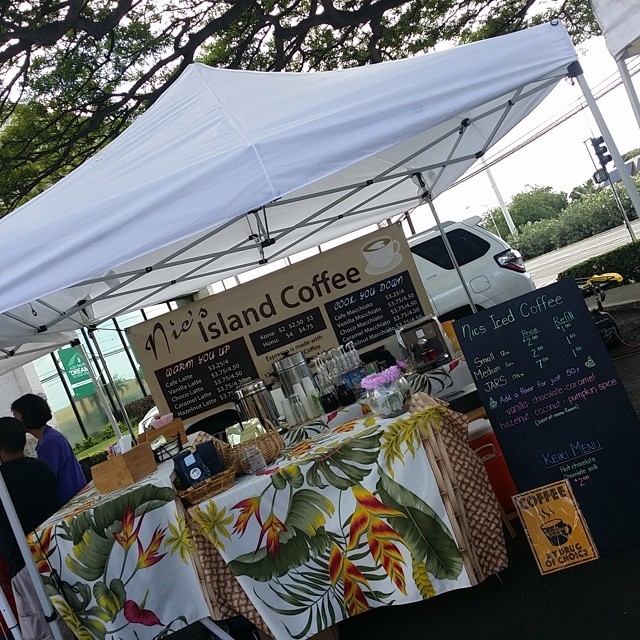 Categories: Uncategorized | Tags: Aloha, arabica beans, Blue Tree Cafe', ChadLou's, chocolate, coffee, Coffee Bean and Tea Leaf, coffee beans, Coffee Farm, Glazer's, Hawaii, Honolulu, Island Brew, latte, Maholo, Nic's Island Coffee, Oahu | Permalink.